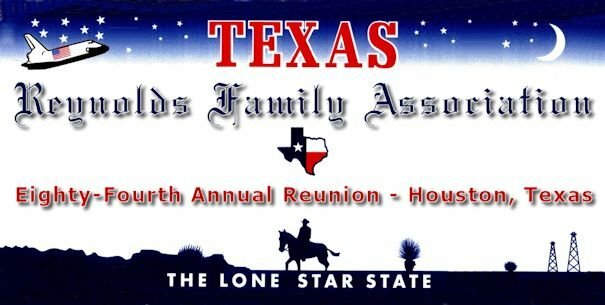 For the first time in the history of the Association, a reunion was held in Texas, it having been decided at the 2013 meeting to hold the following year's gathering in Houston, thus enabling members from the west and midwest to attend, therefore the Eighty Fourth Annal Reunion of the Reynolds Family Association was held at The Hampton Inn & Suites, Houston Medical Center / Reliant Park near the Clayton Library for Genealogical Research in Houston, Texas, on September 18th, 19th and 20th, 2014. We ordered some rain and cooler weather for our Northern visitors so that the Texas Heat wouldn’t get to them, however the afternoon of the 18th through the 19th, Houston experienced flash flooding, some of the worse ever for the month of September. This not only caused some of our members delays in arriving at the meetings, a few had to cancel altogether. Despite the weather those attending agreed that a good time was had by all. Thursday the 18th was spent meeting each other, exchanging stories, and welcoming our new members. Thursday night most agreed to go to dinner together where we continued our fellowship. Friday morning we enjoyed two wonderful guest speakers, Susan D. Kaufman, Manager of the Clayton Library Center for Genealogical Research gave a wonderful, fun and educational program on "Unusual Sources...or...this is some really cool stuff”. Sue also talked using the Clayton Library for Genealogical Research effectively. Jeannette Piecznski, a professional genealogist, lecturer and author brought us a program entitled "iGenealogy: The Good and Bad of Internet Genealogy", I think everyone in attendance learned something helpful about genealogy searches on the Internet. Friday afternoon, almost everyone, went to the Clayton Library Center for Genealogical Research where we not only toured the library but also had time for individual research. Everyone returned tired, but seemingly happy. Friday night at our “No Host” Dinner at Luby’s was a big success not only a great meal, but we wound up staying 30 minutes after closing time chatting and planning. On Saturday Morning The Business Meeting was then called to order at 10:00 a.m. by RFA President Joe Reynolds. The first order of business was a video by Reverend John Allen Reynolds, Sr. a new RFA member from Orange City, Florida, who offered a prayer to open our meeting. Next was a recording of the Reynolds Family Hymn provided by RFA Member Michael Eugene Reynolds, Decatur, Illinois. After hearing reports from our Vice Presidents, Secretary, and Treasurer, we discussed old and new business as well as elected officers. The 2014 Annual Report will be available shortly to give all information on these officers and a detailed breakdown on the Reunion itself. Copyright © 2014 Larry Joe Reynolds, Mount Pleasant, Texas U.S.A.